Caffe Diemme Espresso Coffee – a rich, smooth and balanced blend, at its best when made as espresso. A shot of Caffe Diemme espresso. 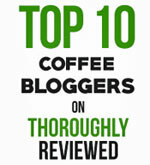 This is the second espresso coffee we have reviewed from the kind folks at Blanell Coffee. Thanks! The first coffee was their La Brasiliana. This second coffee, Caffe Diemme, is equally good, but with a different taste profile. Caffe Diemme is prepared and packaged on Padua, North Italy. It is a blend of Central and South Amercian beans, and roasted specifically to deliver an outstanding espresso. It’s worth noting that the various beans used are not all roasted in a single batch. Each type of bean is roasted separately, allowing the roaster not only to bring out the best characteristics of each bean, but also to create a more balanced blend. You can check this yourself by looking at a handful of the roasted beans. You’ll see some are roasted darker than others. Finding the optimum roast time for each type of bean – and then blending them in the right proportions - goes to the heart of the roaster’s art. As with the la Brasilian, we tasted the Caffe Diemme as both a coffee and as espresso. For the coffee, we ground the beans, brewed with a French press, and then let the coffee cool for a few minutes before tasting. It’s a great brew. Rich, without being overwhelming. It has a bitterness or acidity that is balanced and fills the mouth. There is a light fruitiness there as well, to give it a sweet finish. Remember those individually roasted beans? That’s what gives this coffee such an interesting taste profile. Plenty of separate notes, each balanced with one another. Next, we tried it as an espresso. This time, of course, grinding a separate batch of beans to a much finer grind. It is as an espresso that you really feel that balance and harmony. The bitterness falls away a little, the sweetness rises to the surface, and the feel in your mouth is amazingly rich, smooth and full. 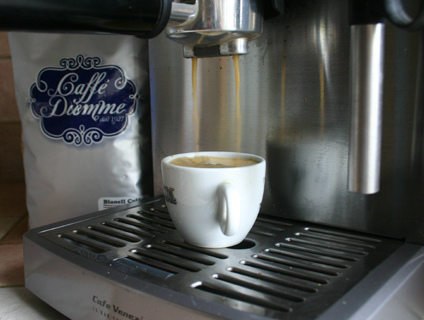 Either as a coffee or for espresso, we can recommend Caffe Diemme. But to be honest, it’s at its best when used to make espresso. You can learn more about Caffe Diemme espresso coffee at Blanell Coffee. Note: As an Amazon Associate I earn from qualifying purchases. 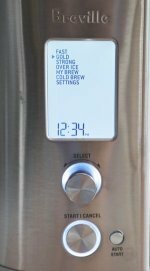 The Breville Precision Brewer gives you the control to make coffee with the same level of fine-tuning you get with pour over. Cold Coffee Drinks Recipes for the Summer. Here are some cold coffee drinks recipes to keep you refreshed during the hot months of summer. Reduce post-workout muscle pain – by drinking coffee. A recent study suggests that drinking two cups of coffee before exercise can actually reduce post-workout muscle pain. If you want to buy a gourmet specialty coffee that suits your personal taste, you’ll need a few facts to help you choose. © Copyright 2006-2019. 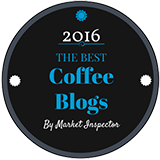 CoffeeDetective.com. All rights reserved.